I geeked out at the Green Crab Summit in Portland earlier this month. Which is kind of ironic given that I double majored in English and French in college. I’ve always had a fascination with life in the oceans … just not enough to want to embrace organic chemistry in college or graduate work. I parlayed my majors into a writing career that often drew on investigation to dig deeper into newspaper and magazine stories. The European Green Crab story is compelling. It’s also emblematic of humankind’s ability to alter natural balances with long-term negative consequences. We’re working to nail down the timing of European Green Crabs here in the states. 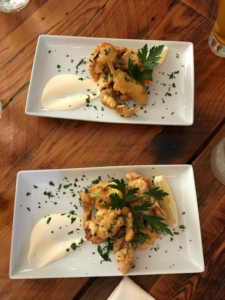 These soft shells were a delicacy at Enoteca Athena in Brunswick, Me. Photo: Marissa McMahan. Abundant in Spain, France, Italy and other European countries, the green crab is not the frighteningly destructive, ecosystem-tipping species that it is here in North America. Many predators there like fish, crabs and birds help keep green crab populations in check. And Italian fish harvesters and chefs have figured out how to create a market for soft-shell Mediterranean green crabs (a slightly different species than the crabs we have here), as well as a top-dollar market for green crab as bait. That’s not the case on this side of the Atlantic. The crabs were first officially documented between New Jersey and Cape Cod in 1817 after presumably hitchhiking aboard trans-Atlantic ships in the ballast. Their spread up the coast was steady and relatively uninhibited. To be sure, some were gobbled up by native species here such as striped bass, tautog, lobster, blue claw crabs and other species. But they weren’t and aren’t the regular diet for native species here as in Europe, and therefore they continue to spread. Different story for other invasives, though. We’re now finding that the newly invasive Asian Shore Crab (first noted in 1988) seems to be displacing and possibly preying upon green crabs, dropping their populations significantly along rocky intertidal zones in Southern New England and heading northward as the water warms. However, we’re kind of swapping out one pest for another. Christopher Baillie of the Marine Science Center at Northeastern University said Asian Shore Crabs are “generalist eaters” that may have an appetite for many native species such as lobsters, Jonah crabs and molluscs. While there are some Asian Shore Crabs already in Maine, he said they may be up here in bigger numbers in the near future. That’s not good considering they’re rampant in southern New England, where they’ve changed ecosystem balance by dominating once diverse habitats, with densities of up to 200 crabs per square meter. Green crabs are tough, voracious, fertile and very hardy. They can live for days out of water. One crab can eat up to 40 mussels a day and lay 165,000 eggs a year. They are adapting to winter, which seems to be changing their spawning habits. They decimate vital eel grass beds while rooting out mussels, oysters and soft shell clams. It’s the soft shell clams that have suffered the most at the claws of the green crabs. Casco Bay has witnessed a 70% drop in soft shell clam populations in the past decade. Maine’s landings have dropped from 8 million pounds in the 1970s to 1.5 million in 2016. Recent studies suggest that without significant steps to protect larval clams, 99% of the settling clams (the larval and growing stage molluscs) will fall to predation, and much of that comes from green crabs. Milky ribbon worms have also become a big problem. 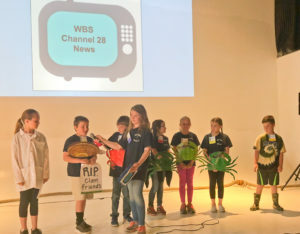 The news was even bleak on the West Bath School Channel 28 News, as students showcased what they’ve learned about green crabs…that they’re devastating to soft shell clams. 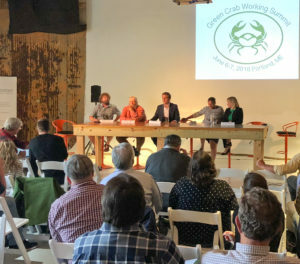 Adaptation will be central to protecting the soft shell clam industry and co-existing with green crabs, according to several researchers at the summit. 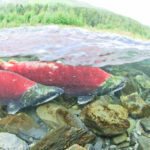 As Sara Randall of the Downeast Institute put it, “We have to think of green crabs as a permanent part of our ecosystem. We need to be active, not passive.” Sara was part of a team of researchers that sifted through more than 34 tons of mud in a four-year study to determine what’s happening with soft shell clams and devise strategies such as protecting larval clams in screened boxes in tidal flats that would keep out green crabs. However, as with everything concerning green crabs, it’s not that easy. Brian Beal has been studying green crabs and their impact on intertidal ecosystems for more than 30 years. 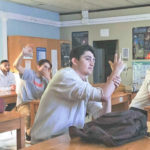 A professor at the University of Maine at Machias, Brian has been outspoken about adapting to the new reality of green crabs and their impacts. “Population control is unlikely and impractical. 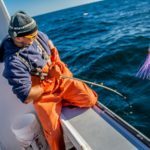 They can’t be fished out,” he said, explaining that we’re talking about billions of organisms based on several trapping studies throughout the Gulf of Maine. 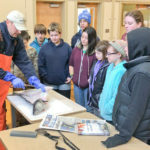 Commercial fisherman Jamie Bassett showing West Bath School students how to extract crab roe. One of the common discussion threads was finding ways to make humans the alpha green crab predator. How can we create culinary markets to make green crabs an attractive seafood choice? Again, it’s not so simple. First, their size means there’s little meat yield. And they’re built like tanks, so there’s a bunch of effort to get a small portion of meat. Second, we Americans have a track record of following habit and price when making seafood decisions. This explains in part why 90% of the seafood we eat is imported. It’s cheaper and hews to menu selection we are most familiar with. Shrimp, salmon, tuna, etc. 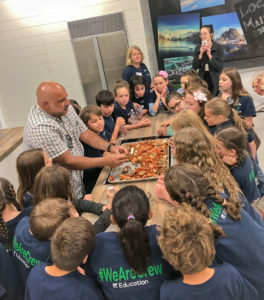 Collectively, we aren’t adventurous, and so, since we haven’t been eating green crabs for centuries, as they have in Italy (again the slightly different Mediterranean green crab), creating the marketing campaign to get us to start eating vast quantities of green crabs is a hard sell. Chef Ali Waks-Adams laid down some green crab rangoon. I know several chefs in coastal Maine and New Hampshire who are ready and willing to give it a go. Soft shell, stock, mixed in to other dishes. 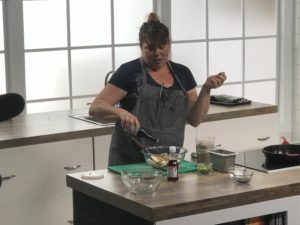 For example, at the event, Chef Ali Waks-Adams (executive chef at the Brunswick Inn) prepared delicious green crab Rangoon using mince (crabs that have been finely ground up, shell and all into a flavorful paste). She also demonstrated how to fry up the small crabs in a batter and eat them like popcorn. 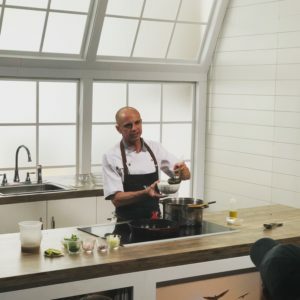 Chef Matt Louis (executive chef/owner of Moxy and The Franklin in Portsmouth, NH) created an inventive green crab pozoles dish and a delicately flavored green crab arancini. All of the food we sampled showed the tasty possibilities. Chef Matt Louis using green crab for a pozoles, a traditional Mexican stew with hominy. We still have a bit of research to do to nail down the soft shell season for green crabs. That’s because we don’t have the centuries of research the Italians do, and because the green crabs here seem to be adapting to the warming waters of the Gulf of Maine, which seems to be changing when they molt, or shed their old shells. Also, it’s easier to identify pre-molt Mediterranean green crabs than the species in the U.S. But even if we do create a viable market, we aren’t likely to make a huge dent in the green crab population. “The variability in density and mean size [of the crabs] will make it difficult to create a dependable fishery,” said Beal. He also dropped another theory that raised several eyebrows. Clams aren’t just worried about the typically sized 3-inch or bigger crabs, but the 3 millimeter crabs feasting on clams that are half a millimeter in width. And it’s going to be damn hard to do much about those little s—s. Beal agreed with others that adaption will be key, and we’re going to have to make some dramatic changes to the soft shell clam industry if we want to protect it. Some of his suggestions included increasing the amount of clam farming that now occurs, changing the size limit on clams to allow for the prime breeders to reproduce, and closing certain areas along the coast from May to July to allow for more productive spawning. Some of the green crab brain trust discussing policy and other issues and how we need to continue to research and collaborate to better adapt to the new reality of Carcinus maenus. We heard about one success in green crab mitigation in Canada from Gabrielle Beaulieu of Kejimkuik National Park Seaside Parks in Nova Scotia. She explained how a team of staff and citizen scientists harvested more than 2 million green crabs over a 10-year period. Following the intensive trapping and removal of the crabs, researchers noticed significant gains in eel grass recovery (in areas that crabs had mowed down) and soft shell clam populations. Green crabs pose a significant threat to several commercially vital species in the Gulf of Maine. I agree with Brian Beale that putting a bounty on green crabs alone isn’t going to make a huge dent. However, I agree with others at the conference that we’re going to have to adapt, and implement a multi-pronged approach to mitigate the challenges. We’ll need to have some widespread harvest/green-crab-as-food markets opened up, along with raising public awareness both about the ecological threat and the culinary benefits of green crabs. We’re also going to have to take some significant steps as Brian mentioned to safeguard species like soft shell clams. And yes, we need to devote more time, effort and financial resources to figuring out how to address this problem, and the looming time bomb of the Asian Shore Crabs. Knowledge is power … In this case, the power to adapt, rather than be overrun.